It's never too soon to find fall treasures and this pair is definitely one of them! 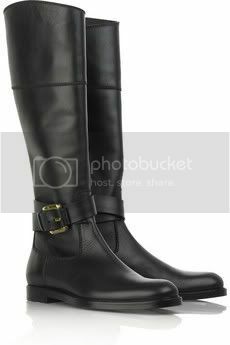 The Black Leather Riding Boots by Burberry are an example of design that is made to last and stay current in a dimension that is independent of time. Apart from being the utmost in comfort, these boots are chic and classic in a very relevant way. You can wear them now, they are perfect for rainy summer days! For more on how to adapt your summer outfits to not so sunny weather, click here. Even I could walk in these boots! Great job! Those are too cute. I've always loved riding boots.